DO-90080-10 was succesfully added to your cart. Attractive transparent body with large 1.2" digits LCD easily attaches to a window or piece of glass. Used to continually monitor temperature in storerooms, control rooms, fume hoods, laboratories, cleanrooms, refrigerators, plant areas, or just about anywhere else. It may also be attached to the outside of a window to view outdoor temperatures. 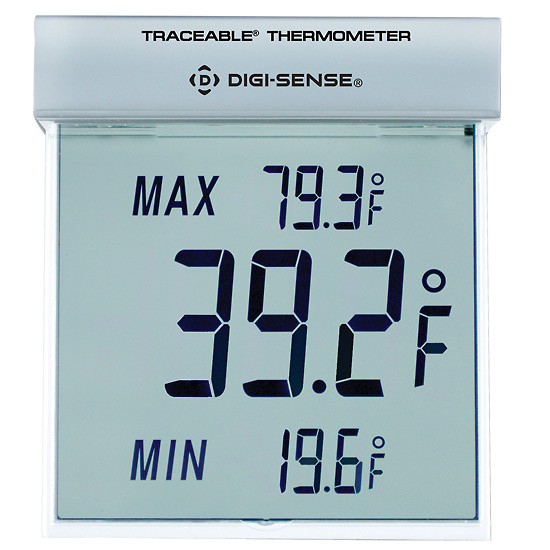 Simultaneously displays current temperature and daily min/max readings. The thermometer automatically clears and updates the min/max reading daily. is the display glass or plastic? If I need to calibrate my thermometer to comply with state regulations, where must I send my thermometer to have it recalibrated? How much would it cost? and How long would it take? For re-calibration, please call the number above to schedule the calibration. For this thermometer, the calibration is item number 17003-00. If purchased, this would be used in a small medical laboratory to measure room temperature. We are not opened on the weekends, is there a way to see the lo and high temperatures that occurred on the weekend? If not, do you have another product to suggest? Also, this is NIST calibrated and warranted for a year.. How do I know the temperature is correct couple years down the road? If you would like to see the min/max readings over the weekend, you can clear the memory before leaving Friday. To ensure the temperature continues to be accurate after a few years, you will have to get the unit re-calibrated. Can these thermometers be placed inside the refrigerator and freezer or for outside on the body of the refrigerator and freezer only? Are daily min/max temps stored in memory? How can they be retrieved? The daily min and max temps are displayed on the screen. They change every 24 hours. Do you have a model that reads in Rankine? We do not have a unit that reads in Rankine. The battery life is application dependent, and should be proactively replaced every 6 months, but may last upwards of 12 months. Does it come with a certificate ? NIST-traceable calibration report supplied by the manufacturer is included. Does it store daily min/max in memory , or does the info disappear once it refreshes daily? Min/max readings automatically reset after 24 hours. Can this product be wall mounted? Yes. We mounted it on the wall in our cooler. it works wonders and is so easy to read. It can be mounted almost anywhere using the mounting hook, mounting tape, or suction cup. All options are provided. Product used on windshield of car which doesn't have an outside temp gauge. Although not in the sun and in upstate NY in late Spring, it registered 131F. The high that day was 90. So although it's helpful, it's adopted use might be stretched. Merchant response: I am sorry to hear about your difficulties with the item. If this unit does not function properly for any reason, replace the battery. Low battery power can occasionally cause any number of apparent operational difficulties. Replacing the battery with a new fresh battery will solve most difficulties.